The idea for the creation of the Brotherhood with Iraq emerged in 2009 among a group of fellow students strongly moved by the situation of Iraqi refugees in Syria as reported in the media at that time. So they searched for ways to bring help to these people expelled from their homes and displaced by the horror of war, terrorism and danger. Yet, exams and schoolwork impeded their determination to help. But at the end of 2010, the terrible attack in Baghdad’s Cathedral which caused the death of 58 people and wounded 72 others, reminded them of this as yet unachieved project and brought them to a point of urgent action. By chance they met Bishop Louis Sako who was then Kirkuk’s Archbishop and who is today the Patriarch of the Chaldeans. He approved their idea of forming such a support organization, and he invited them in his diocese. So the Brotherhood with Iraq was born. 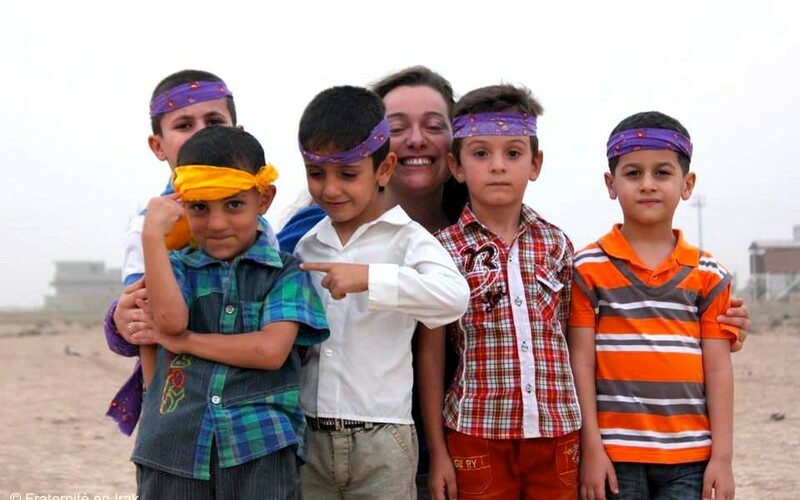 - Helping displaced minorities within Iraq who face emergency situations. - Reinforcing the minorities’ integration thanks to projects which benefit the majority of the inhabitants in areas such as health and education. Faithful to its statutes, the Brotherhood with Iraq’s members went to the Iraqi Kurdistan during the summers of 2011, 2012 and 2013, and they implemented their projects in the two cities of Kirkuk and Qaraqosh. Friendship links appeared progressively between French youth and Iraqis, reinforced by the trips to Iraq and maintained throughout the year. The shock increased for the members of the Brotherhood with Iraq in June 2014 when the organisation “Islamic State” (ISIS) took over Mosul, a city which some of the association had been to many times; then Qaraqosh, where the association had spent a few weeks. Friends began calling in the middle of the night, on the road to exile as known and loved places fell into jihadists’ hands. Thanks to the great generosity of its donors and its knowledge of the local personnel, the Brotherhood with Iraq reacted immediately. Soon, in June 2014, its members were among the displaced people in Erbil to bring moral support. In August 2014, over the course of two weeks, they lived in the refugee camp of Mart Schmouni and brought emergency assistance to the tens of thousands of people who had fled the Nineveh Plain. Members of Brotherhood with Iraq continue to bring this emergency assistance as they also continue to build their long term projects. Help us continue our project !